On Monday I visited our summer camp in Ventura, CA (my hometown!) to see this recipe in action. I’ve been tinkering it for years and finally have the perfect version. Plus in our class we have all of the kids make the classic and vegetarian (with tofu) version. A Chinese Classic made of juicy pieces of chicken coated with a delicious orange sauce. Our version is healthier because 1) It’s not deep fried and 2) We use only a bit of honey to sweeten the sauce so it’s not overly sweet. Place the flour, eggs, and breadcrumbs in three separate bowls. Season chicken and tofu with a pinch of salt. Take a few pieces of tofu and place them in the flour making sure to coat each piece evenly. Dust off the excess flour and put it in the egg mixture to coat. Next put the tofu pieces in the breadcrumbs, shake off excess and remove to a plate. Continue until all tofu is breaded. Repeat the same process with the chicken. Heat about ¼ cup oil in a large sauté pan over medium heat. When the oil is hot, add the tofu pieces in small batches and fry until golden brown on both sides, about 4 minutes, flipping halfway. Remove to a paper towel-lined plate and repeat until all of the tofu are cooked. Repeat the same process with the chicken. Cut one large piece in half to make sure it’s fully cooked and white on the inside. It helps relieve stomach nausea and pain. Orange chicken, as we know it, is believed to have come from Chinese dishes that are both sweet and sour. It is popular in America and you won’t find it on a menu in China. It’s made of battered and fried pieces of chicken that are coated in a sweet orange-flavored chili sauce, which thickens or caramelizes to a glaze. 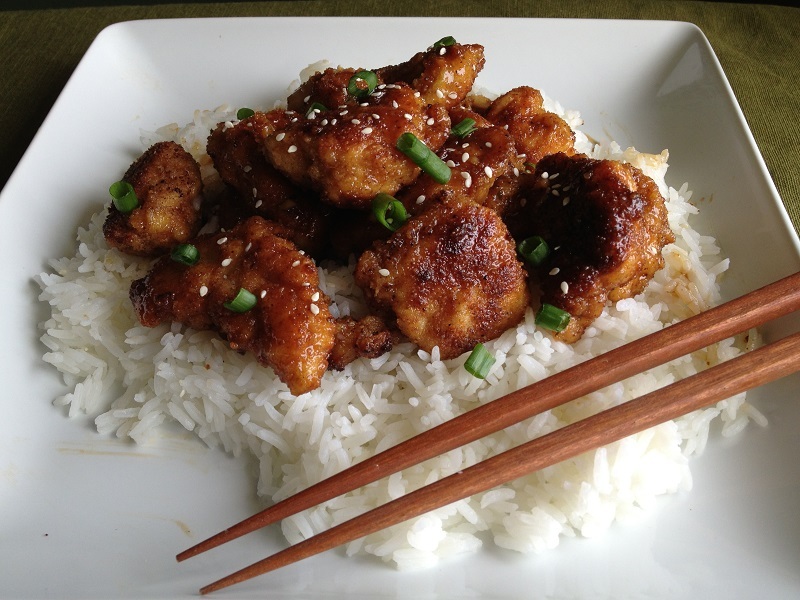 Chef Andy Kao claims to have developed the original Chinese-American orange chicken recipe at a Panda Express in Hawaii in 1987. Are you going to try making this recipe with your kids this weekend? P.S. Have you heard what parents are saying about our Cooking Birthday Parties?